Samantha Halvorsen is a junior cross country and track runner at Wake Forest. She was a four-time All-League selection in cross country and earned three All-County honors while at Ridgewood High School. 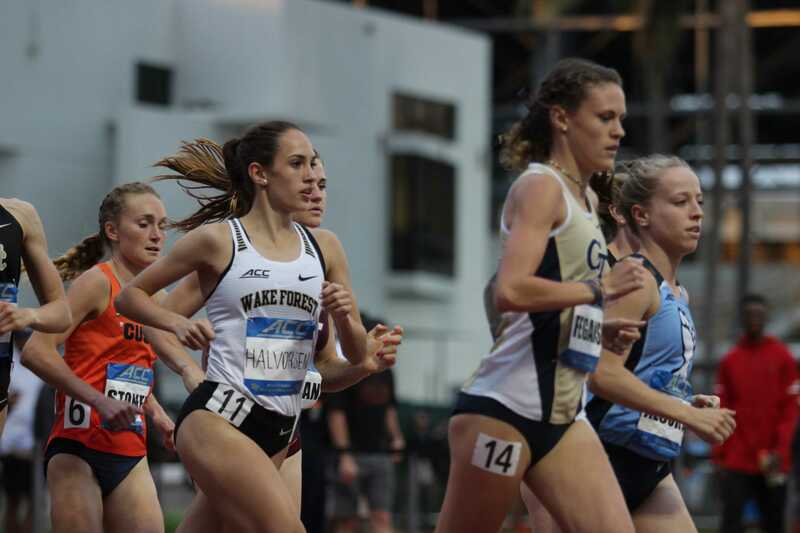 Halvorsen had a breakout season during her sophomore year of college, during which she raced in five meets and earned both All-ACC and All-Region honors. Will May: Would you say that the WFU cross country and track programs have evolved since your freshman year? Samantha Halvorsen: Both the cross country and track programs here at Wake have changed dramatically since my freshman year. My freshman year was the first year we had with our current coaching staff, so there were a lot of changes in team culture and attitude. The coaches have instituted a lot of new programs from training to team bonding trips to mandated stretching routines, not to mention moving practices from 3:30 p.m. to 6:30 a.m. However, all of their changes have been to instill a philosophy of dedication and hard work throughout the team, which I think is easily reflected in the results we have been producing as a program. WM: You had a considerable amount of success last year. Keeping that in mind, how do you feel about this season? SH: I was lucky to have raced well on the track this past season, but cross country has always been my favorite season of the three (cross country, indoor track and outdoor track), so I am looking forward to a continuation of that success this season. The team aspect of cross country is what makes it so special, as races always involve seven girls. Success alongside your teammates is always more satisfying than solo success. WM: Do you have any major goals or plans for this upcoming XC season? SH: The success that I was fortunate enough to experience last year has really motivated me towards having bigger goals for this year, both for myself and for the team. I think everyone is really dialed in this year, aspiring towards the same big goal of making nationals. Each year that I have been here we have gotten closer and closer to making that mark so, fingers crossed, this is the year. WM: What has been your greatest challenge you’ve faced as an athlete or student at Wake Forest? Do you have any tips for coping with the challenges of being a student, an athlete, or both? SH: My freshmen year I had a serious hip flexor strain that resulted in being on crutches for about a month as well as four months of physical therapy exercises. Not being able to run was incredibly frustrating, especially because with the added time commitments of physical therapy and cross training I had even less time in my day to dedicate to school work. While this was a frustrating time I relied a lot on my coaches and friends to keep me positive and focused on getting healthy, their support meant a lot. WM: What meet or race are you most excited about? SH: I am really looking forward to our regional meet this year. We are competing at Rock Hill South Carolina on a course that no one on the team has run before, so it will be fun to share the new experience together. Additionally, at regionals last year we were less than 50 points away from qualifying for nationals (which in cross country is not a lot) so I am hoping we can qualify this year. We only graduated two seniors from our top seven team last year so we will be bringing back an even stronger team than last year. WM: Do you have any favorite memories from any previous seasons of Wake Forest cross country? SH: My favorite memory with the team was when we finished fifth at ACCs last year. We had been working really hard all season with the anticipation of peaking for that meet as well as regionals, and to finally see all the work start to pay off was a great feeling. Of the seven athletes that competed in that race three had just joined the program that Fall, so to have such success with such a new team was really motivating, and lots of fun too. We had run the same course for a different race a few weeks earlier so to be able to see a drastic improvement in such a short time was rewarding.